The actor Adolf Wohlbrück could look backSo it diodn't surprise that Adolf Wohlbrück too entered this road. He took play lessons at the school of Max Reinhardt and obtained a five-year contract at the "Deutsches Theater". His first movie parts he played already in 1915 in "Marionetten", a further silent movie came along in 1925. However his real career began rise of the sound film. With "Maskerade" (34) he achieved a great success which brought him in a contract with the Ufa. In the next few years followed successes with "Der Student von Prag" (35), "Michel Strogoff" (35) and "Allotria" (36). The career was rude interrupted because of the polical situation in Germany and Wohlbrück emigrated in 1936 - during the Olympic Games - to France, then to the USA where he could realize a film each. Afterwards he took up residence in England. 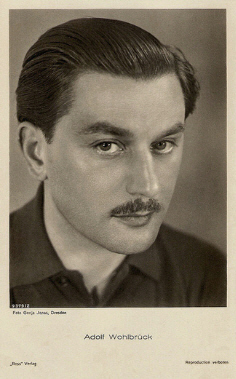 There he found work in the film business under the name Anton Wolbrook and deserved credit. To his well-known movies of this time "Gaslight" (40), "The Life and Death of Colonel Blimp" (43) and "The Red Shoes" (48). After World War II he also appeared on German stages but he German film business couldn't offer him hardly anything. During a performance at the "Münchenern Kleinen Komödie" Adolf Wohlbrück collapsed, four months later he died because of a heart attack. He was buried in England. His mourners had flowers delivered to show their sympathy.